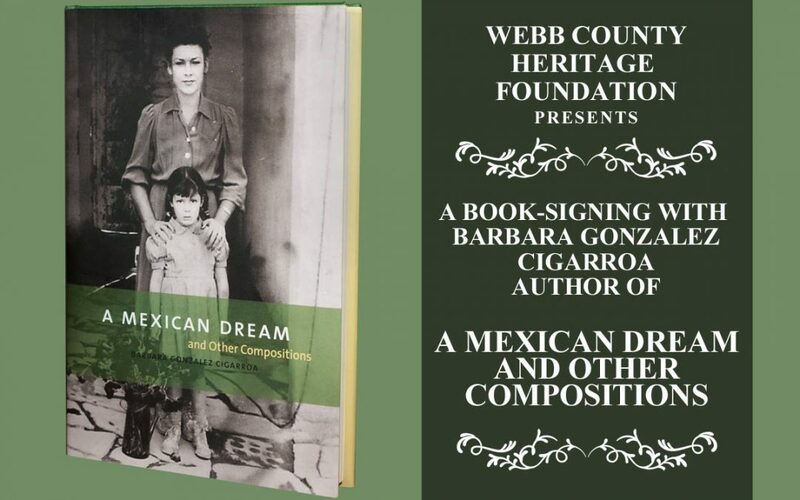 The Webb County Heritage Foundation will host a book-signing for Barbara Gonzalez Cigarroa, author of A MEXICAN DREAM and Other Compositions, on Friday, April 13 from 6 to 8 p.m. at the Villa Antigua Border Heritage Museum, 810 Zaragoza St. in Laredo. A presentation by the author will take place at 7 p.m. Books will be available for sale that evening. In one of the book’s first chapters, Cigarroa writes of her great-grandmother’s resolve to make a life for the family after being left destitute and widowed with five young children in Mexico City. Doña Rebecca Iriarte González de la Vega opened her home as a boarding house for students of the nearby Universidad Nacional Autónoma de Mexico (UNAM). Here begins a Gonzalez Cigarroa family tradition of nurturing the art of thoughtful conversation. The boarding house dining table hosted lively debates among medical students, philosophers, engineers, law students, and poets – all interchanging ideas and opinions. Many of these students became important figures in Mexican history including Adolfo López Mateos, President of Mexico from 1958-1965 and José Vasconcelos – philosopher, educator, and political activist, who became Minister of Education, to name two. Barbara Gonzalez Cigarroa was raised in a family of ten children in Laredo, Texas. She has worked as an immigration attorney both in New York City and in El Paso, Texas, and was recently selected by the Department of Justice to serve as an immigration judge.